Are we ready for harvest party time?! My excitement that Thanksgiving is just one week away is UNREAL. I’m excited to be back in the kitchen again but mostly, I’m just excited to eat a hugely delicious meal and have all of my favorite flavors together. Super pumped. Thanksgiving punch is invited to the party! It’s only been over ten days since I had Emilia but I still haven’t had a proper cocktail yet. I haven’t been feeling it with the sleep deprevation and what not, so I’m thinking that Thanksgiving will be the day. Now I just have waaaaay too many cocktails to choose from. Also. I’m pretty sure this is my last punch recipe of the season! Eeeep! So many holiday choices. Let me tell you about these amazing harvest-y flavors! We have both pomegranate and blood orange Italian sodas. You should have luck finding both right now and I always find mine near the more specialty sodas in the grocery store. We also have apple cider, because it’s been two months and I still can’t get enough. It’s the best. And the flavor just screams Thanksgiving. Then for our boozy components, we have bourbon, orange liqueur AND brandy. All three! AND then we have a bunch of fresh fruits, so it sort of takes on a sangria-like feel. I am more than obsessed. Now! I know a bunch of you might ask how to make this non-alcoholic, but since it has so many different components, I’d actually go with one of my other mocktail recipes if you want something non-boozy. This sparkling pomegranate punch is my favorite but the cranberry cider punch is also SO good. In my mind this is definitely a starter cocktail to your Thanksgiving feast, but a small glass during dinner wouldn’t hurt either. You can just sip on it the whole day? Mix all ingredients together in a large pitcher or punch bowl to serve. Taste and adjust the beverage to your liking. Is it too boozy? Add more apple cider. Not boozy enough? Add more bourbon! Make it your own depending on the flavors you love and how boozy you'd like it. You can make this a bit ahead of time and it will stay great in the fridge. 2017 Holiday Gift Guide: Stocking Stuffers under $25. What a festive delicious looking drink! I’d like a mocktail Bourbon, I’ve been assigned the designated driver for the holidays, so I think I’ll save one for Black Friday, Yum! It’s so pretty! That would definitely help me through the day. LOVE the punch bowl and glasses. You’re killing me, Smalls! I had already planned on making your Pomegranate Orange Punch for Thanksgiving, but this one looks soo good! LOVE!!! It’s gorgeous and it sounds SO delicious! & can I just say that Emilia is the cutest and I love all the Insta stories with her & Max. As a non-bourbon lover, do you think subbing another alcohol would work? I love the sound of the other ingredients! i think you could probably do spiced rum for sure – still have that holiday like feel? Yummy! Love the glasses….where did they come from? thanks!! they are from anthropologie! love this! my go to holiday punchy drink is called a Poinsettia. oh guuuuuurl! so good….can’t wait to try this one too! This looks amazing! I am having trouble finding the pomegranate Italian soda tho. Any suggestions? Jessica, Happy Thanksgiving to you and your family. 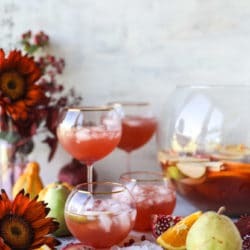 I am planning to go with Sparkling Pomegranate Punch this Thanksgiving. I will keep you posted on my guests’ reviews. I’ve been trying to find the perfect punch! Do you mind sharing what the soda brand would be? Like a pellegrino? I had a delishous Thanksgiving making several of your recipees from this punch, to your no bake chocolate pumpkin pie, cranberry sauce and mushroom stuffing. All were delishous and a huge hit! Thanks for the recipees and inspiration! YIKES. I am ready to make this but have NO bourbon… Any ideas for substitution? Thank you for responding so quickly… This is great without the bourbon… I did add extra grand marnier as well. I am ready for Thanksgiving… Thanks again.